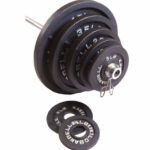 CAP Barbell is a renowned company which is famous for making high quality equipment since a very long time. Their equipment is usually used in commercial gym and home because they require less space and money to meet your desirable needs. The best feature about CAP Barbell’s equipment is their sturdy nature that gives a lot of strength to their equipment. Their most used and highly rated equipment are dumbbells, kettle bells, racks, ropes, barbell and any other storage accessories. Everyone wants to have a bulky chest and huge biceps. These parts of human body requires great work and strength to properly construct them in a rightful manner. 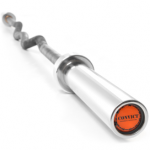 A special type of barbell which is highly recommended to let your fitness goals achieve faster is the EZ curl bar. The difference between a normal barbell and an EZ curl bar is its excessive spin rotation due to its different design. 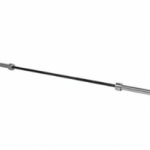 The EZ curl bars are widely used to make your biceps and upper body bigger. For that, CAP barbell have introduced their one of invention by manufacturing the two inch deluxe curl bar. 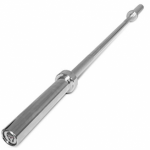 This barbell comes with a weight of 30 pounds which has the ability to withstand weight up to 800 pounds. The length of the bar is 57 inches while the height and depth is 3 inches each. The barbell is constructed with solid steel which consist of a black oxide finish. This is a bushing bar and bronze bushings are used. The sleeves of the barbell are kept standard which can accommodate weight plates having a dimeter of two inches very easily. The knurling done on the barbell is medium in depth which let you easily adjust your hands on the barbell. Two years warranty is included with this EZ curl bar. The 2-Inch Deluxe Curl Bar by CAP Barbell is used especially to perform upper body workouts which lays great focus on mass, strength and endurance. This bar is important to perform bicep curls and forearm exercises while reducing the pain from wrist and elbow respectively. 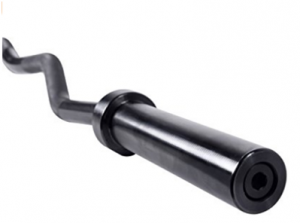 The barbell is constructed using solid steel with a high quality black zinc oxide finish. The barbell looks very sturdy while the zinc oxide finish gives an eye warming feel. Zinc oxide doesn’t have a good reputation regarding chipping and peeling. The coating do have the ability to prevent the bar from rust, but its oxidation rate in humid regions is very high, hence making this curl bar vulnerable in such environments. Though there is still a way to maintain the design and looks of this barbell that is with a light coat of WD-40 or three in one oil. These ointments are trusted worldwide and are mostly used by many gym owner and weight lifters in such cases. 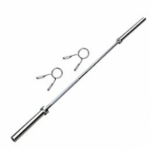 The length of this EZ Curl bar by CAP barbell is fifty seven inches while the diameter of sleeves is of 50 mm which is considered standard in barbell market. Every two inch Olympic weight plate can fit on these sleeves very easily. Loading or unloading might peel off some of the paint if the bar not maintained properly. The weight of the barbell is 30 pounds which has the capability to handle weight up to 800 lbs. There may be a level of consideration that, how a barbell can bare such capacity in a very low weight, the answer is because of its high quality construction and durable material. With such weight capacity you can admire how high the tensile strength of this barbell, since CAP barbell didn’t mentioned it. 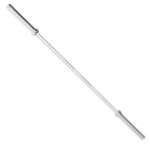 Having a high tensile strength means that this barbell is very powerful and less whipper. Whip provides an assistance, a feel at the time when you are performing exercises such as cleans and snatches. Though this barbell is a curl bar, so I don’t think those exercises are pretty much recommended to be done with this equipment. The knurling on the bar is moderate and consist of diamond knurled hand grips which helps you to comfortably adjust your hand on the bar which further facilitate it through rotating sleeves. The knurling of the bar might not please professional weight lifter as they ask much of aggressive knurl. Though, it is recommended for starters to use gloves if you are feeling that this knurl will damage your hand or might slip in heavy weight set. CAP barbell backs each and every of its product with a warranty. In this deluxe curl bar, a warranty of two years on manufacturer parts is included in which bending or breaking are covered. 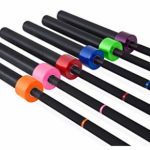 The barbell comes with free shipping which eventually decreases its price tag even further. The bar is best for home or commercial gym because it’s pretty much affordable then most of Curling bars. Thus, giving you a chance for work out different exercises to strengthen and gain muscles. The weight of this barbell is 30 pounds. Have the ability to withstand weight up to 800 pounds. The length of the bar is 57 inches. The height and depth of this barbell is 3 inches each. The barbell is constructed with solid steel. Black oxide finish is done to give this barbell great look. This is a bushing bar and bronze bushings are used. The sleeves of the barbell are kept standard, with a dimeter of 50 mm. Can accommodate weight plates having a dimeter of two inches very easily. The knurling done on the barbell is medium depth. Two years warranty is included with this EZ curl bar. In my opinion, the two inch deluxe curl bar by CAP Barbell is a very genuine and high quality EZ curl bar ever produced in fitness equipment market. It consist of impressive durability and budget friendly price tag. I purchased this barbell to make my biceps and upper body. The barbell arrived on my doorsteps within four days, with free shipping and immensely well packaging. When I opened the box there was a smell of I think black zinc oxide coat, after putting the barbell on roof for couple of hours that smell also went away. used this barbell for workout of especially bicep curls and while doing it I experienced that the grip and knurling on the barbell is very stiff and comfortable, while the bronze bushings were giving the collars a good and repetitive spin. The weight capacity was really up to the mark. Overall this was a high quality barbell and a brilliant purchase, which led me to have a much stronger upper body and biceps. The bar is very affordable with respect to its functionality and durability. Construction of the bar is very sturdy. Suitable for upper body workout. 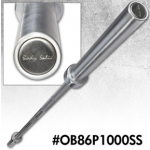 The moderate knurled shafts makes the barbell very comfortable and secure to handle. The brass bushings provides a very repetitive spin even in heavier weight set. Accessible to perform less range of exercises. Black zinc oxide isn’t suitable to be used in humid regions. Black zinc oxide cannot prevent rust and corrosion that easily. Can’t handle wear and tear of regular gym abuse.